Review Context: I have not played physics-based vehicle games quite like Rocket League, but I have played arcade style vehicular games, such as Twisted Metal, Jak X: Combat Racing, and Mario Kart. 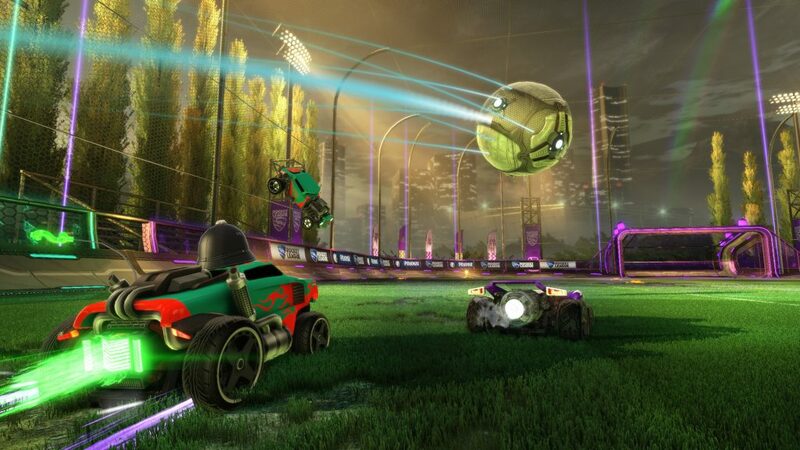 Just what exactly is Rocket League? A short answer would be, it’s the fusion of demolition derby and the popular sport of soccer. 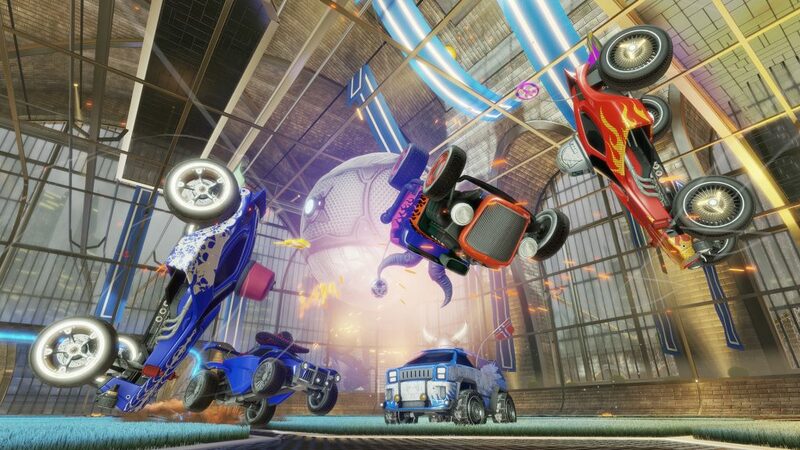 Now on paper, this might not sound like the best idea, but the talented folks at Psyonix are determined to prove that these two foreign elements can combine to make a highly enjoyable game. I had the opportunity to play the early access beta, and I found it to be highly enjoyable. I thought it would definitely be a huge hit, if given more polish. Fast forward to the game’s launch, I finally got my hands on the final product. 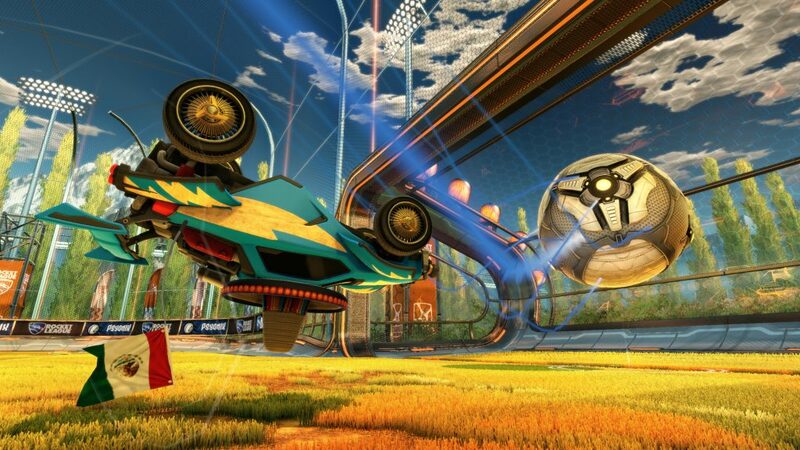 So, was Rocket League’s potential fully realized, or was it a complete disaster? 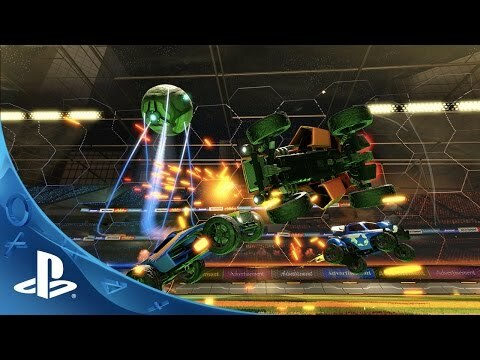 So here’s the concept of Rocket League: You take two turbo powered RC cars, put them in a large soccer-like stadium with a huge ball, and have them try to score in opposing goals. There are generating boost pads stationed all over the stadium, giving your car that necessary boost and more power to your shots. There are no out of bounds; the stadium is fully enveloped in strong metal glass, giving you freedom in how you maneuver around it. With enough skill and turbo, you can even drive upside down on the stadium’s ceiling. Now as far as the controls and actual gameplay go, there’s quite a bit going on here; you have your basic car controls such as accelerate, reverse, and the left stick to control your car’s movements. The advanced controls are where things get truly interesting; you can jump, double jump, execute front flips, back flips, and you can even seemingly fly for a bit, and hit the ball while it’s high up in the air. Rocket League’s controls feel right at home. They are user friendly, as anyone, regardless of skill level, can pick up the controller and have a blast. The key to winning is finding the perfect angle, and making sure your shot hit it’s target. Of course this is easier said then done, as other players will make sure you don’t get your way. Made shots are hard to come by, especially against skilled players. I found myself screaming in excitement whenever I scored a goal. Oh, and did I mention you can obliterate other cars by ramming them at full speed? It’s a smart tactic, and it’s just plain awesome and satisfying to pull off. You can also hold the triangle to focus on the ball. This is a very helpful tactic, as it can get somewhat tricky to keep up with the ball. The advance techniques require good timing and execution, so it’s great that this game also includes a very helpful training mode. This mode includes basic and advanced tutorials, as well as challenges. There’s also a free training option, which allows you to freely practice everything you’ve learned. I found the training mode to be really helpful, and I highly recommend it to anyone who’s looking to become a pro at this game. There are currently only four playable game modes in Rocket League, but they are very deep and highly enjoyable. These game modes include training, season, exhibition, and online. There’s also a garage mode where you can customize your car’s wheels, body, antenna, and even the color of the turbo trail you leave behind as you boost. There are many cool options too choose from, and you can unlock plenty more as you play. In season mode, you pick your team logo, the car you drive, your team’s name, as well as the duration of the season and playoffs. You can also choose the difficulty, which ranges from rookie, pro, and all-star. Rookie is very easy and requires little skill, while pro gives you a moderate challenge. Pro is where the competition truly lies; your A.I. components are very skilled and relentless, and unless you can match them in skill, I recommend steering clear of this one. A.I. partners is a different story. They are very incompetent, and at times they would actually score for the opposing teams unprovoked. I recommend playing with human partners when playing teams, to avoid frustration. You can also pick how many cars will be in the stadium; from 1v1 to 4v4, those setups are available in every game mode. Exhibition is essentially versus mode, in which you can choose to play with the A.I. or with friends. You can also pick the stages and team size, giving you complete control in how you want to play. The biggest feature in this mode is four player split screen; it might be a dying fad, but it’s there if needed. The feature that truly impressed me was the ability to play every game mode, including the multiplayer, with a custom party. I found that this added even more to the replay value which was already fairly high. The graphics look excellent, especially for an indie title. The cars and stadiums are beautifully detailed, and I loved the amount of detail put into the grass itself.The different stadiums look similar, but they utilize different backgrounds and colors, which help to distinguish them. I found that the metal and techno influenced soundtrack meshed well with the intense action unfolding on my screen. Also, I appreciated when the crowd would appropriately react when I would score a goal or block a shot. Of course, this game would not be complete without an online multiplayer component. When online, you can play with randoms or hop in a party to play with friends. You have your normal mode, which caters to the rookies and people who are still getting the hang of the game. If you want a real challenge, you can play in the ranked mode, which has much more skilled players and allows you to level up faster. Oh and did I mention that there’s a level up system? You level up in any game mode, whether you win or lose, and you gain even more points the better you perform in matches. For example, scoring a goal or stopping the ball from reaching the goal earns you extra points. It’s also important to note that you start off as a rookie, but as you increase in level your rank changes. As of right now, I’m a level 15 semi-pro. Rocket League also features cross-play, which allows PC and PS4 players to go head to head online. During online matchmaking, the next player I was matched up against differed from the last, which was pretty impressive. Cross-play is a magnificent idea in my opinion, as it not only allows the online community to grow in numbers, but also feel more unified. As of August 11, 2015, cross-play is only for random matchmaking, meaning custom cross-play parties can’t be made yet. Psyonix has promised more updates to enhance cross-play. There are some minor problems with the online multiplayer; there were instances where I would invite someone, and it would take more than two minutes for them to receive it. Me and my friend got over it, but this can be annoying, especially when you’re short on time. Also there is some noticeable lag during random moments. These issues are not game-breaking, as they are mostly very brief, but they should still be addressed since they can tend to break up the action. Overall, I highly enjoyed the multiplayer, especially with friends. There is tons of replay value here, and I found myself playing for hours because of all the fun I was having. Rocket League has garnered plenty of praise, and I echo those sentiments. I have put in countless hours with friends, and I do not plan on putting it down anytime soon. Rocket League just gets everything right; from the lush and vibrant stadium, to the deeply involved gameplay, multiplayer, game modes, and car customization. If you need a break from more of the same, I highly recommend Rocket League. It’s a breath of fresh air, and guaranteed to be a good old time. Overall I was highly impressed with Rocket League, and I’m looking forward to future DLC, and perhaps a sequel (fingers crossed).